I have an overwhelming aversion to so-called Reality TV which extends to any program that could remotely be considered related so I had never seen nor knew about Irish Sport’s Company Amphibia Sport and its founder Adrian McCreevy appearing on (and winning, I think or is that the relevant term?) Dragon’s Den for new businesses, until a conversation with Guillamenes local Tadgh Cronin, whom I’d met in the depths of Waterford’s coastal winter. Adrian had designed a sport/gear bag specifically for the exploding triathlete market and Tadgh introduced me to it. Long, short, I got an Amphibia X-Bag, their top-of-the-range messenger-bag style product. Designed primarily for triathletes it’s perfect for the travelling swimmer and I got one just the day before I left for New York and MIMS. (Notice, the website is flash-heavy, bit of a pain if you have a flash-blocker installed, like I do, static links are generally best and far easier to link to). The bag has a couple of cool features, but one of the best is the internal removable dry bag which has a Velcro closing, which is good because zips and salt water don’t mix (as all my surf-board bags are now proof of, the zips having all clogged and broken). So the reliability (if you’ve read my reviews you know I rate reliability second only to function) is excellent. The dry bag is a heavy vinyl type material, with the opening at the top. Perfect for carrying wetsuits but also for us skin swimmers, your damp swim gear and towels. Any swimmer knows even a mildly damp towel will eventually soak everything in the same bag if it isn’t sealed. Another feature I love, and important here in Northern Europe in the depths of winter, is a removable neoprene changing mat. I can tell you from painful experience that when the sea is 5° or 6° Celsius, the ground will regularly be 3° or 4° degrees. Ow. Trying to change standing on that is not a mistake you make repeatedly. I’ve previously used a rubber car mat but this neoprene mat is great for travelling, easy to store in a bag and more comfortable for numb feet. 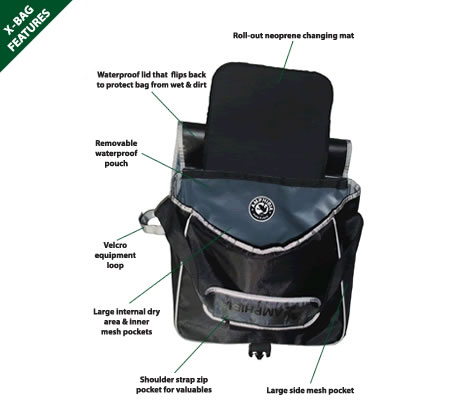 Apart from those features, the bag is heavy-duty and tough and the outer bag is water-resistant also. I used it as carry-on luggage for New York, it has a side pouch for a sports bottles, and a nice phone/money holder integrated in the strap and a few internal mesh pockets also, just the right size for my Kindle. I’d posit the bag has another (but very small) market; swim crew. On my last visit to Dover I reverted to my old wheelie suitcase, that I’d used for years of travelling. On the return I had to fly Ryan Air having gone over on Aer Lingus. And while my luggage was within weight restrictions I still got caught by Ryan Air’s predatory baggage size restrictions. I was one of those people you see in airports, and ended up throwing a towel and pair of sandals into the rubbish. (Approx cost €15/20 versus the €50 Ryan Air would have charged me. Had I taken the Amphibia X-Bay I’d have had no such problems because it would have easily passed Ryan Air’s Luggage Capture & Extortion Device™. Bloody Ryan Air, I hate them. Never again, my X-bag will be the bag of choice from now on. Pricewise, they are not the cheapest, but a lifetime of various sports has taught me that you get what you pay for and any time I’ve bought cheap kit I have always regretted it. I went through a few cheaper swimming and gear bags before I wised-up. And the Irish people reading this will understand this but Amphibia don’t screw us on the Sterling-to-Euro conversion. Too many times as we all know, we see a Sterling price and the Euro price will be heavily marked up (Tesco, M&S etc), a £10 item could well be €20. If you are unfortunate enough to have an endurance athlete in your life and you are looking for an present for them, this is ideal. The bag is also available on Amazon of course. (Purchasing an item from an Amazon link on loneswimmer.com returns a small fraction to the site to help defer running costs). Amphibia have a very cool, small and highly desirable and useful product for open water swimmers and triathletes coming soon. The Ring, a simple ingenious idea, a silicon ring that fits over any ring you are wearing to stop you worrying about losing it when your hand contracts in cold water and meaning you don’t always have to remember to take your rings off beforehand, just keep it with your goggles. Simple genius. I really like the look of their Evo bag also, looks like it would be great for a pool kit bag, and perfect replacement for my badly battered and worn Zoggs pool bag. With all the swim toys to carry and endlessly getting wet, pool bags get quite a battering. I’m open to testing it out! Anyone? All in all, I love the X-Bag, highly recommended for open water swimmers (and those triathletes it’s actually aimed at, I guess). I got an Evo bag and whilst it is a bag, it’s a bit crap in my opinion. Cheap connections (handles and strap) mean it’ll rip and come loose in a few months. The dry section feeds back into the main section, which seems a good idea, but makes packing harder than just using some dry sacks (as you have to contend with two compartments using the same space). The side pocket is tiny and the zip runs down and then sideways, so not as easy to do up and undo, as a conventional central zip. There is no reinforcement on the base and the plastic (yes the whole bag is a bit plasticky) is already wearing just a few weeks into use. I paid over £25 for mine and think it’s really only worth a tenner at most. Interesting Carl. I like the Evo but only use it for travelling. I’d be very unhappy given the cost if that happened me. 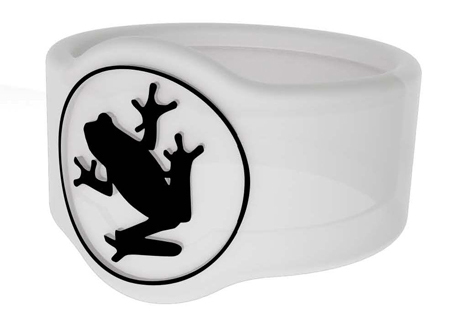 You could contact founder Adrian McGreavey on Twitter @AmphibiaSport and see what he says?